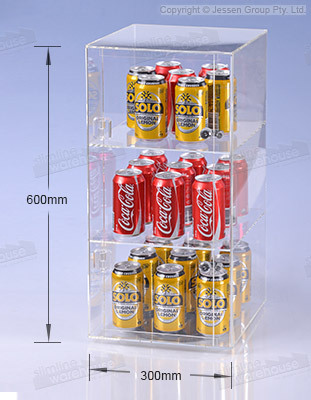 This counter top food display helps you display items for customers to peruse in style. The clear acrylic display is made from 3mm thick plastic that offers a full view of content whilst providing a durable stand. Three levels offer heaps of space for placing items without taking up too much space on a countertop. These countertop restaurant cases are found in coffee shops, bakeries, cafes, restaurants, and more as an easy way to keep goods safe whilst on display. 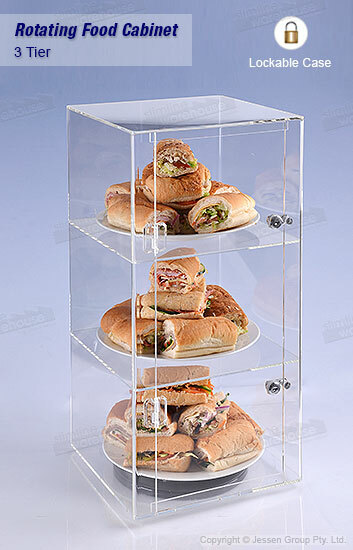 This counter top food display, part of our line of hospitality displays, is lockable to secure anything placed inside. The dual-locking display includes keys for employees to easily access interior to remove items. The base of the case features a spinning bottom, so accessing each side of the stand is easy no matter where your are positioned. Order today for a long-lasting display that looks great in any location! Check out our vast online catalogue, full of hundreds of different products to outfit your business in a stylish manner to outperform your competition! Slimline Warehouse has been a leading provider of goods to Australians for over 20 years! Orders placed by 1pm EST will despatch same day to Sydney, Melbourne, Newcastle, Bendigo, Perth, Adelaide, Brisbane, & anywhere else in Australia with most in stock items!